Please note that admission prices for special events may be different. Special admission rates are available to groups of 12 or more persons. Advance reservations are not required, but additional benefits can be made available to groups who schedule a visit more than two weeks in advance. 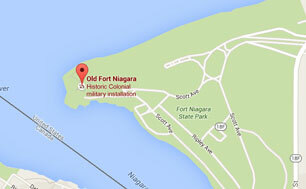 Please telephone Old Fort Niagara at 716.745.7611 for more information. Open 9:00am daily, all year around. Closed January 1; U.S. Thanksgiving; December 25. The last admission each day is one-half hour prior to closing time.